Proper filtration (especially biological) and circulation, cleaning and maintenance, proper/optimum chemistry and feeding. It is also noteworthy that well built pond that is in harmony with nature needs much less maintenance. This article will also deal with winter care tips, pond predators such as Herons and much more. We have to remember too that a pond is living organism, unlike a swimming pool. 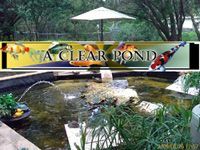 Essentially a pond is an aquarium with the added bio load of leaves, pollen, run-off and other debris often being added to our aquatic environment. Often this seems to be forgotten as I have come across many a pond over the years where the filtration was comparable to using a Hydro Sponge #1 filter designed for a 10 gallon or less aquarium for a 250 gallon aquarium. In other words, woefully inadequate. 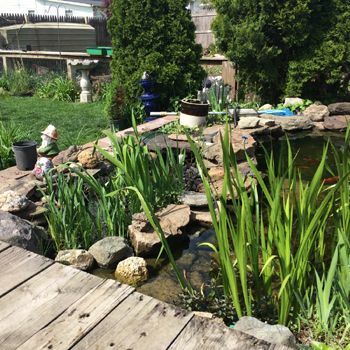 Placement of your yard pond is important, despite popular belief a pond is best placed above any low spots in your property as drainage from a rainstorm (or even over watering) can foul your pond adding many unwanted nutrients and more. The sides of your pond should be built up at least a few inches. I also recommend a minimum depth of 24”. Obviously a raised patio pond will not have this issue. Done right, a well set up and maintained pond improves the beauty of your home and garden and this regularly updated article, as well as the useful links to other resources such as Veggie Filters, UV Sterilization, and Pond Algae (green water) should help the reader achieve this with a garden or patio pond. Please take most of these recommendations/suggestions as just that, as often there are similar products that might work just as well. In the case of UV Sterilizers, I have VERY extensive experience, from designing, application, experimenting with controlled tests and more; so my recommendations for true UV Sterilizers (including specific brands there in) is based on this considerable experience and the use of equipment other than recommended will likely NOT yield the same results, especially based on email from those who have read this article but still chose a different path for this important equipment!! For this reason, I stand by the suggestions/recommendation more strongly, again not that good results cannot be obtained with similar equipment, just that many of the Sterilizers I do suggest, especially the AAP/TMC lines, I have decades of experience with and this includes use of competing products that simply have not performed as well in 100s of applications I have been professionally associated with. A good example is the TMC Professional 110 & 30 Watt True 'Category A' UV Sterilizers which along with others in this line of UVs has performed as well or better than any other comparable UV and at a better price & high longevity too. Finally, my experience and the other professional pond keepers I get input from is generally for ponds up to 8000 gallons, so admittedly for much larger ponds, any prospective reader might find some great information here, but need to go further for added information. Also PLEASE read the many additional resources already supplied here such as those cited for Veggie Filters or UV Sterilization. ADEQUATE WATER CIRCULATION AND MOVEMENT (Pumps). A general principle (not a rule) of about 50-200 gph per 100 gallons can work for this (A lower proportional gph for large ponds, a higher proportional gph for small ponds). This can be achieved with more than one water pump. A large aeration device (air stone) coupled to an Air Pump can also aid in circulation and are especially useful for “lifting” (vertical circulation) water from the bottom of a pond when properly placed. Often an air stone/air pump combination is better than water pumps of greater gph for the aspect of vertical circulation (keep in mind that an air stone aerates the water by breaking surface tension, not by the bubbles in the water; the more surface agitation, the better oxygen exchange). A large double air pump such as a Fusion 700, Million Air 600, Whisper 800, or Maxima with two air stones can circulate at a rate up to 500 gph. A way to check this is to place the air stone down a narrow PVC tube or aquarium lift tube, then place the top of the tube just above the water level and measure the rate the water fills up a gallon container (one gallon in 15 seconds= 240 gph). With any pump (Water or Air), at least some form of circulation should be provided 24/7 so as to provide both oxygen and also to maintain a healthy bio filter (this also means a pump connected to a filter should run 24/7). Most pumps properly placed do not disturb fish, based on my experience. For cross circulation (& lifting water to water features), a water pump is the primary choice. To start with the Rio HF Pump line is an excellent line of pumps for most ponds from 300 to even 6000 gallons from my experience as these pumps have top notch head pressure, they are reliable and have flow rates up to almost 2000 gph. What I have found is that even with larger ponds having multiple reliable and powerful pumps such as the Rio 32HF, I have more redundancy, more flexibility, and simply less "disasters" with a single "super large" pump pond. As an example, I set up a 3000 gallon pond with three 2000 gph pumps feeding a fountain, veggie filter, two UV Sterilizers, and a DIY barrel filter and then a waterfall with good aesthetic flow. In my many years of pond maintenance using many different brands, I have found that regardless of what a pump manufacturer or retailer tells you, ALL POND PUMPS ARE EASILY CLOGGED OR EVEN QUICKLY RUINED BY DEBRIS! Whether you purchase one of our recommended pumps or use a pump you already have purchased; if you do not take steps to prevent debris from clogging your pump, you will be setting yourself up for future headaches and pond pump failures. 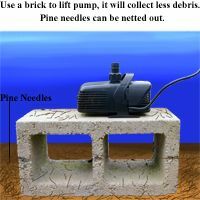 To protect your pump from large debris that can damage the impeller and impeller housing (this is a must with mag-drive impeller pumps), placing any water pump off the bottom of the pond on a cinder block or similar can keep large debris from quickly clogging pump intakes. For further protection, you can place your pump in a DIY bucket (or box, etc.) 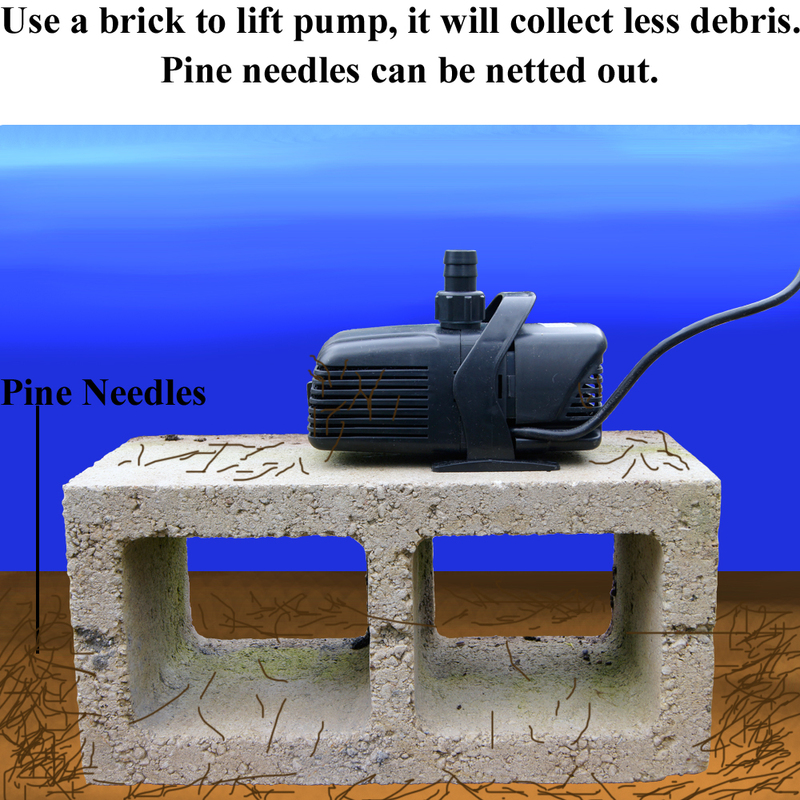 pre-filter, or simply cover the pump with 1/2" to 1" rocks (porous lava rock is best). Besides protection from debris, this added pre-filtration will provide some added biological filtration, but it does not replace a filter. This is especially useful for pumps added solely to run UV Sterilizers due to added pre-filtration. 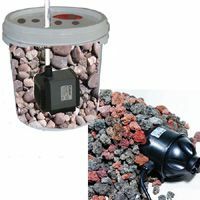 METHOD: Use a bucket, box, or similar container such as a Rubber Maid container large enough to house the pump; then add Volcanic Rock about ½” in diameter or larger, an outlet tube, then either seal the container with holes in the top OR simply leave the bucket, box, or similar container open with only the rocks/gravel exposed. A void space next to the pump intake will also extend time between rock rinsings. To the left is a diagram of how this would basically work. I recommend some sort of rock pre-filtration or similar with ANY submersible pump place on the pond bottom!! From my experience this GREATLY extends pump life regardless of any manufacturer claims as I have had very expensive pumps with so-called built in pre-filters fail in one season without this rock pre-filter. It is noteworthy that this rock will likely need to be cleaned ever few weeks to a month depending upon bio load and whether or a not a REAL filter is also employed. Better is to incorporate this as part of a REAL bio/mechanical filter such as some of the ideas in our Veggie/Bog Filters article. See the picture to the right, click on for further information. For small to medium ponds (100–800 gallons): the SunSun HQB Series Pumps, or Rio 1700 all are proven in professional pond maintenance to be efficient and reliable, as well as reasonably economical pumps (the Rio 1700 has an available water Fountain Kit). Both have sealed electromagnetic motors and ceramic shafts. 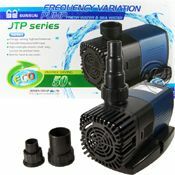 The lighter duty SunSun JP-066 can also be used in ponds, however I recommend using either the Filter version or making a pre-filter bucket to protect it due to the standard JP-066 pump not having a pre-filter (described below, which is a good idea for any pump unless a Hydro Pond Pre-Filter is used, which cannot be attached to a JP-066). For even more head pressure for high pond features (such as a water fall or spitter) that require lifts of much more than 6 feet the Rio HF Water Pump line is without comparison with their Vortex Rotor Blade (which can lift up to 14 feet), especially for the price. For Very large ponds; often the best way to go is with a heavy duty submersible pump with a directional vortex impeller or a pool/spa style pump that is designed for the harsh pond environment (some pumps cannot stand up to the debris and other elements of pond water circulation). This said, my preference even with the 6000-8000 gallon ponds I have plumbed, I vastly preferred the redundancy of two or more heavy duty submersible or 'amphibious' pumps such as those suggested in the next paragraph over these pool/spa pumps such as the Seahorse. As well two or more somewhat smaller pumps will almost always provide a better flow pattern and work better with most filters and UV Clarifiers. The AAP JTP-12000 pumps (pictured above) have now been out for a while, these have really impressed me as "the pump to have" for any medium to high flow submersible application due to reliability, flow and super high electrical efficiency!! The only negative with this pump is that while extremely efficient as per electrical usage, the head pressure is not as good as the AAP JAP pumps for a given flow rate. For "out of the water" pumps, the Pentair SeaHorse line of pond pumps offers flow rates up to 4900 gph and are very well made reliable pumps that usually handle the harshest of conditions. For those needing an out of the water pump of lower cost & more versatility, the before mentioned 'Amphibious' (in line OR submersible) AAP JAP line of pumps might be a good choice. For these heavy duty 1/2 to 3/4 hp pumps, Heavy Duty submersible Pumps, or similar I have generally used 1.25 to 1.5 inch PVC pipe and then split the return pipe suing PVC ‘Ts’ and valves to control flow through other pond filters such as a Pressurized Filter and a UV Sterilizer. The purpose for this is to run multiple filters, UVs and/or to have a slower flow through these devices which generally work much better than at the high flow rate provide by this type of pump. Using PVC 'T' Diverters also allows for the use of these large pumps for smaller ponds under 1000 gallons where multiple features and/or high head pressure features are being run. 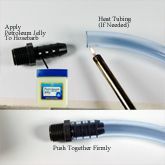 Sometimes flexible/vinyl tubing will be difficult to connect, however by lubricating the connection, then heating the tubing, along with clamping with a standard hose clamp in some instances, this should not be a problem. This works for clear, black and ribbed tubing. See this tutorial or help with tubing connections with your UV Sterilizer, Pump, Filter, etc. Dissolved oxygen is VERY important in ponds (partly for the Redox Balance). All oxygen is exchanged at the surface, so good surface agitation over the entire pond is best. Waterfalls, fountains, air stones all can achieve this. Low dissolved oxygen levels and a low KH & GH (below 50/100 ppm respectively) affect your fish’ ability to perform osmoregulation & Redox Balance will be poor. If these parameters are poor, this will allow for much more opportunistic infections. 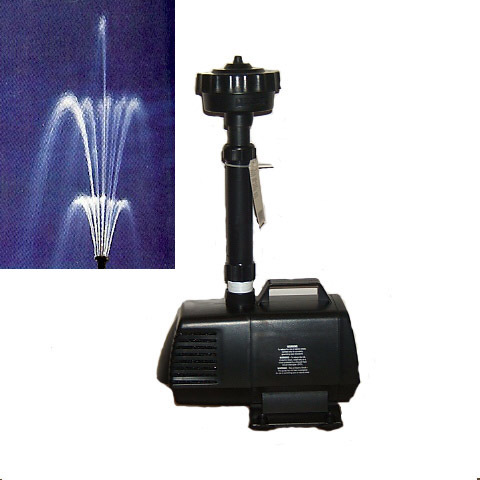 The fountain head in the picture to the left (click to enlarge) is an excellent way to aerate. Make sure in winter months to de-ice and circulate water to the surface for optimum fish health. 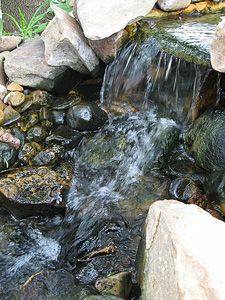 Good filtration, especially biological is essential to maintain a healthy pond with the only "maybe" exception being with a “flow through/spring fed” pond. Understanding the Nitrogen Cycle, which is the same in a pond as in an aquarium with the added input of debris from trees, wind borne, and sometimes wild/domestic animals adding to this strain on the bio system. More than one filter is always best when possible and this includes DIY natural plant/veggie/bog filters which add to the aesthetics and are an enjoyable DIY project based on my experience. As per the overview section of this article, most often ponds I have consulted for over the years are woefully under filtered for the given bio load. Looking at it another way, if what you have for pond filtration (as well as pond pumps) is clogging quickly (requiring cleanings every week or sooner), your filtration IS INADEQUATE!! Of which the Veggie/bog filter can be a great DIY filter project that if done correctly (which more often than not they are NOT built correctly), can perform mechanical as well as incredible bio filtration better than many purchased filters, often by a wide margin! A Veggie/Bog filter should be part of any pond much over 250 gallons. Readers might note that I did not include skimmers in my list above. While popular, I personally do not care for pond skimmers as these often tend to trap water lilies, hyacinth, and other floating pond plants all the while providing little to the quality of pond filtration (other than removal of floating leaf debris, especially in autumn). I have found when I took over a pond care contract for a client that already have a skimmer, I would later disconnect the skimmer after adding a Veggie Filter. Part of the problem is many of the ponds I was called to consult on "after they were built" were built by "pool guys" and skimmers are great for pools, but not ponds and these builders often knew little to nothing about building a living pond, including a bog/veggie filter. In the end, the pond actually was MORE clear with more natural looking floating plants too! So avoid the sales pitch by many, do NOT purchase a pond skimmer by ANY maker as these are simply profit makers for the builders and retailers and long term professionals know that these are simply a device to take money out of your pocket! The picture to the above shows a High Output Pond Pump embedded in loose volcanic rock (for added pre-filtration as noted earlier) connected to a Pressurized Pond Filter and then to a High Output Pond UV Sterilizer/Clarifier. This picture displays how a large pump (as shown with the high flow VA Pump) can be utilized for more than one function, including multistage filtration, UV Sterilization, a fountain and even can be diverted for watering a Veggie Filter. Please note that a control valve may be needed on both sides of the diversion ‘T’, otherwise the water will follow the “path of least resistance”, put another way if your water flow is too slow through the UV Sterilizer/Filter side of this example, it may be that the return is too high above the other return and simply lowering the return will solve this problem. As well after splitting a return line, the lines should not be combined later in the return. Please read the UV Sterilizations section for more on this subject. I generally do not recommend the Pond Master Submersible & especially the Becket filters as they come out of the box; they clog easily and are not efficient filters unless modified. HOWEVER the Pondmaster 1000/1700 can be vastly improved by unscrewing the screws in each corner and adding select pond capable volcanic rock biological filter media to this area under the tray (as the Pondmaster only utilizes two pads that only perform mechanical, some chemical, & NO essential bio filtration). 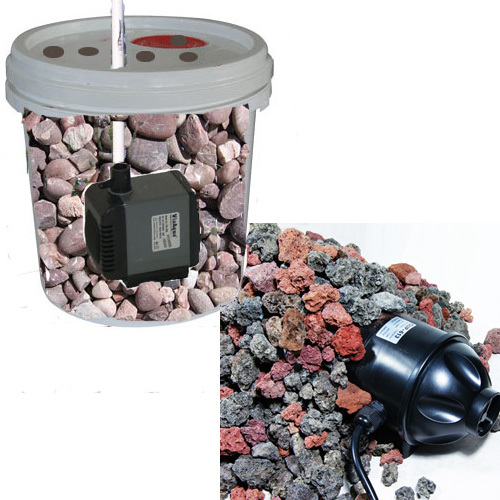 In fact the PondMaster can be an excellent bio filter for the money if purchased with this volcanic rock which increases bio capacity by over 500%, however MOST Sellers of this filter sell it on the "cheap" and unfortunately do not include this, in part because they have no professional experience and because they are attempting to maximize profits while keeping the price artificially low. Volcanic Rock is excellent for this or BETTER yet would be SeaChem Matrix. Both of these would add considerably to bio filtration of your pond by adding to your filter. In fact Pond Matrix provides the best internal macroporous surface area of ANY product and is an excellent compliment to a pressurized filter, waterfall filter, drum, or large sand/bead filters such as the AquaBead. These macropores are ideally sized for the support of nitrifying and de-nitrifying bacteria. This allows Pond Matrix, unlike other forms of biomedia, to remove nitrate along with ammonia and nitrite, simultaneously and in the same filter and rarely if ever needs to be changed if properly cared for. I also suggest replacing the black carbon impregnated pad in the Pondmaster with a cut to fit Poly Pad and add carbon or Zeolite underneath the tray (also in a filter bag). I prefer pressurized pond filters such as the SunSun UVC Pressurized or others for their efficiency and ease of hiding in the ground. 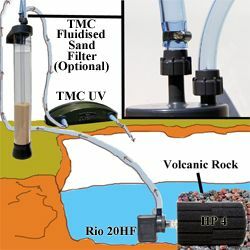 These filters include the popular Tetra, Lifeguard Pressurized, and Cyprio, which are excellent too, but tend to be over priced, especially considering Tetra charges almost $200 more for their UV feature when a separate and VASTLY better TMC Pond Advantage would be better (see the UV Section of this article). The SunSun model pictured to the left, is not much different in design than other pressurized filters, rather what sets it apart is that it is also is supplied with highly bio efficient volcanic rock and and yet is still a lower price and is my recommendation! Pressurized filters can be buried in the ground or place behind a water feature easily. 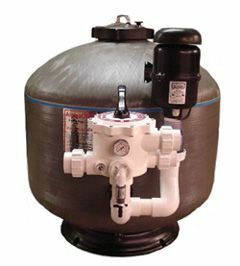 Pressurized pond filters are very good bio filters especially when price is considered and these are also excellent mechanical filters. However many if not most pressurized pond filters are sold with attached/built in UV Sterilizers which when the flow rate/dwell time is considered usually provides only some green water clarification and absolutely NO level one sterilization. A SEPARATE UV such as the TMC Pond Pro Advantage is vastly more effective when plumbed properly including placed after an otherwise excellent pressurized pond filter. Further Reference, a MUST Read for pond keepers!! 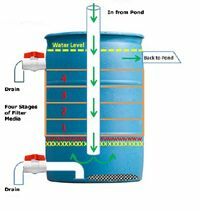 Do NOT confuse an aquarium canister filter with a pressurized pond filter, where as although a pressurized pond filter can be used for an aquarium, the use of an aquarium canister filter for a pond will result in failure since most aquarium canister filters have top mounted motors that will loose their siphon in most pond applications, as well an aquarium canister filter is not nearly as rugged in design for the pond environment (I had a couple of service calls many years back where customers attempted to utilize an aquarium canister filter for their pond and results were not good!). For small ponds and patio ponds (ponds built in above ground "Rubber Made" or other similar containers such as converted horse waterers), large sponge filters are excellent bio filters and reasonable mechanical filters. They are inexpensive, easy to service, and simple to attach with either a power head pump or and air stone. There now is a specific patented Pond Sponge Filter called the Hydro-Pond by ATI, with three models; one air driven, two pump driven. They are useful up to 1500 gallons and more can be used for larger ponds or in combination with other filters. 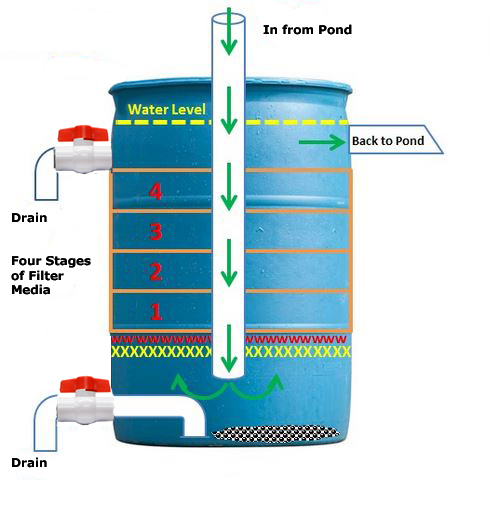 The Hydro Pond IV also makes an excellent pre filter for pond pumps before water is circulated to another filter such as a pressurized filter. For "patio ponds", these filters can perform very well since the only weakness is inability to handle large debris, but with patio ponds this is rarely a problem. In fact one client of mine with a 150 gallon patio pond had a small Becket pond filter he purchased at Home Depot that did not keep his pond clean, however when he switched to a Hydro Pond #2 his water while still somewhat green was much more clean and the fish could be readily seen. A top notch (& unique) filter for ponds up to 500 gallons would be a TMC V2 1500 Fluidized Filter when combined to a pre-filter system as pictured to the left. 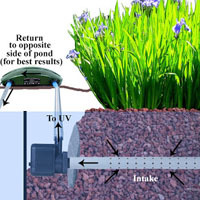 This system would work for larger ponds when multiplied such as two for up to a 1000 gallon pond. The "SunSun CHJ-1503; Small Pond Pump/Filter", "Pondmaster 1700" are other rgood filter choices for small/medium ponds under 500 to 1000 gallons. These filters along with the Hydro-Pond Sponge and Fluidized are an excellent compliment to a Veggie Filter (which I recommend for any pond). 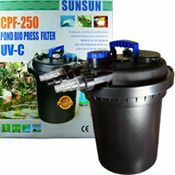 With the SunSun CHJ-1503 or similar Submersible Pond Filter you can easily attach a UV Sterilizer to the “diverter” valve (just above the filter and below the fountain head) for improved water clarity. See the UV Sterilizer section further in this article for a diagram. Bio falls such as the Savio Livingponds Filters are also excellent pond filters for medium and many larger ponds. These filters can also be DIY (Do it yourself) or you can start with a basic Bio Falls “skeleton” filter (pictured to the left) and then add bio filter media (such as Volcanic rock) and place a Polyester Media on top. However if you have purchased a unit such as Savio Livingponds Waterfall filter, you can add extra media to meet your pond needs and possibly save money. For instance I have often substituted Volcanic Rock of different sizes (depending on coarseness of filtration needed) for bio and mechanical media in these and similar filter. Plastic grates and even rocks formed into basin can be used to construct the bio and mechanical filter for flow through either prior to a water all or after (prior is more common). If a cement product is used in construction, I recommend sealing it with a water proof sealer available at most Home Improvement Stores. Use of volcanic rock for bio filtration and Coarse Polyester Media (pictured to the left) can help with the filtration need of your bio falls project as well as other similar projects such as a Veggie Filter pre-filter trap. *As noted earlier, Pressurized Pond Filters are an excellent choice for medium ponds. These can used with other filters for improved filtration and redundancy or even larger yet ponds. You can also use multiples of Pressurized Pond Filters for larger ponds. As well even a smaller pond can utilize these simple yet effective filters, especially where the bio load is high. This is probably one of my favorite pond filter types to use either by itself, in multiples or often with other pond filter types. Two aspects of this filter type I like is their ability to go inline from the pump to any water feature, such as a water fall, while maintaining water pressure (no need for gravity feed). The other aspect I like is these can be partly buried to improve the pond aesthetics. 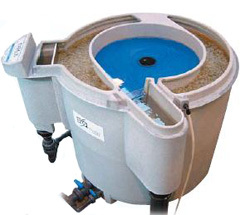 *Another filter that works well with small and many medium sized ponds is the barrel style filter by Tetra and Coralife; these are excellent bio filters, but poor mechanical filters. They also are hard to hide as they have to use gravity to return water back into the pond after the pump first supplies these filters with un-filtered water. This filter too can be a DIY project using a large sterilized drum. *A filter that is also used is pool style sand filters. I have used these filters in many of my largest pond installations (over 5,000 gallons). Despite what pundits for these over priced monstrosities say, they are not originally designed for ponds. The fine sand therein will often compact and the water then tends to follow the path of least resistance thru these filters, leaving areas on anaerobic bacteria producing poisonous Hydrogen Sulfide. DO NOT be fooled by their high price (often well over $1000), I can tell you from vast experience with them that they are not worth it!! That said, if you already have one, I recommend adding volcanic rock and/or SeaChem Pond Matrix to improve upon this problem and also allow for nitrate removal via de-nitrification. These types of filters are purely for nitrifying (removal of ammonia & nitrites but not nitrates), however they are excellent at performing this task (and in fact the BEST)! I do recommend pre-filtration of some sort such as coarse rocks near an intake or at the very least a coarse mesh screen to allow for maximum effectiveness. Of these types, the Fluidized is the most efficient from what I have found, especially the third generation models such as the TMC V2 1500 Fluidized Filter. However these standard Fluidized Filters are only capable for ponds up to 500 gallons unless multiples are used or as a compliment to other filters. The Nexus Moving Bed Filter or TMC Pro Pond Fluidized Filters are a potential consideration for large ponds as their design lends itself better especially to ponds over 2500 gallons. The best is the TMC Pro Pond FBF80 Fluidized Filters with the capacity to handle 176 lbs of bio mass respectively (this is a LOT of fish!). This works out on average to a 2500 gallon to 5000 gallon pond. Their size alone belies their large pond capacity with the FBF80 measuring 61 inches tall and 13 inches wide. With either of these filters, I would strongly recommend a DIY Veggie/Bog filter to provide nitrate removal via plant roots end de-nitrification. The picture to the left demonstrates a DIY barrel type pond filter that could be built by anyone with reasonable DIY abilities. I would suggest using volcanic rock and/or SeaChem Pond Matrix in one of the filter media layers with poy pads or other mechanical media types in the other layers. To the left is a diagram of a very basic "DIY Gravity Flow In-Line Pond Filter" (principle is similar to Tetra or Coralife barrel filters). Volcanic rock makes an excellent filter media for DIY pond filters, waterfall filters, veggie filters (for the base), and many types of commercial filters such as the Savio. This is a very important part of pond keeping and filtration. 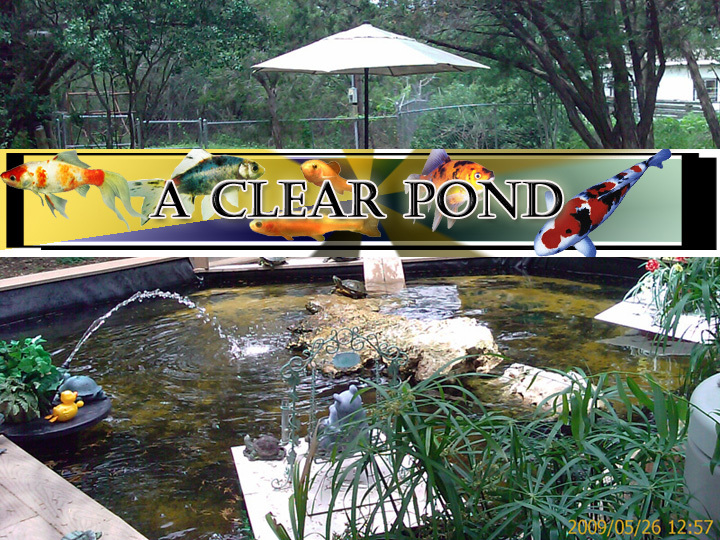 A well planted and diversified planted pond is VERY important for clarity (including green water control), pond and fish health, and even fish breeding. Any plant with a good root structure that grows fast and has the majority of their leaves above water is a good candidate to start with. I recommend water iris for their strong root structure, fast growth, great nutrient absorption, and a great place for baby fish (fry) to hide feed and grow (if you use an “in pond” Veggie Filter). There are many other excellent plants as well such as Cattails, Sweet Flag, Parrots feather, Bluebells, Umbrella palm, Papyrus, & bull rush. Make sure these types of plants (plants with roots in water and leaves above) are planted in an area of good, but not strong water movement. This ensures that they will do their job as plant filters. Other plants such as lilies and hyacinth are reasonable for nutrient removal too, but NOT at the rate of iris and similar plants. These plants also do not have the root structure that will aid in the rapid removal of nitrates and ammonia, and thus should not be a part of a true Veggie/Plant filter. However, these floating plants are useful for shade, which will slow algae growth. I will often place this plant/bog filter in an area of water constriction between two ponds or in an upper waterfall area with low to moderate current. In smaller Ponds I will just place this plant filter in a corner of the pond with a small water current applied to the planted area. 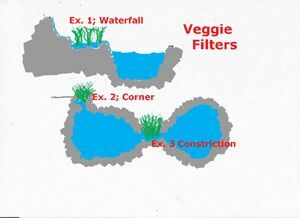 I prefer my plant filters within the pond as these look more attractive in my opinion and give the fish fry a place to hide (except in the case of the waterfall or cascade plant filter). 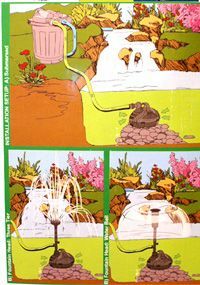 The area of the Veggie Filter should be relatively shallow as well to force water movement over and through the roots. The key is also water movement along with a good media (Volcanic Rock is preferred) around the roots/tubers. While the flow does not need to be 'fast', there should be a definite flow of water through this Veggie/Bog filter. Often a lack of flow and use of a good media such as volcanic rock is why some Plant/Bog filters fail to work very well and algae such as hair algae will then grow out of control. Using PVC pipe with holes drilled and then embedded in this volcanic rock with plant roots that then feeds into a True UV Sterilizer makes all the difference in the world (The cheap UV Clarifiers sold via Amazon, eBay, Lowes, Home Depot, etc. do NOT pass a true UV Sterilizer). In other words, construction and proper equipment is key to the success. 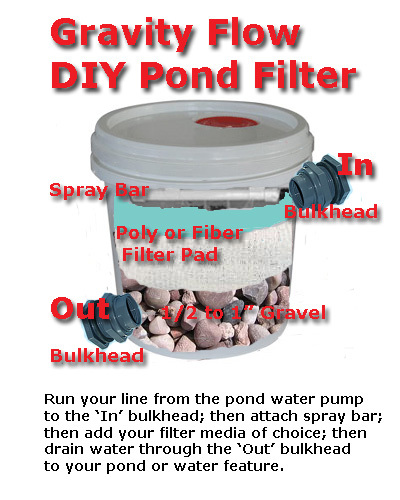 If done correctly, this is a DIY filter that often far exceeds anything you can purchase or at the very least will compliment any other pond filter. Other methods include separate veggie filters in containers or pools. I am not as fond of this method for the reasons above, however these can work. This article includes much more information on this subject, as well as links to resources for bog plants and similar. The bottom line is few ponds in my opinion are truly complete without a "Veggie/Bog Plant Filter" as they can make a big difference when done right in pond clarity. As an example, I had one pond I built for a client that had such a large and efficient Veggie Filter that it stayed clear without the UV Sterilizer running. For those who read this, please note that my emphasis of the use of Veggie filters is not driven by financial gain, as although I obviously list products to sell through my many articles (as a means to pay for the time to keep these articles up to date), I have little to gain since Veggie Filters are primarily a DIY products. The picture above/right is of a pond with relatively new Veggie/Bog filter where water flow was also recently added improving the results. Although not always necessary in a well planted, well shaded, well filtered aquarium; these devices are still very useful if only for the benefits of a true level one capable 'Category A or B' UV Sterilizer that goes beyond clarification. The time it takes to clear a green pond with a UV Sterilizer/Clarifier can vary greatly from 1 day to a couple weeks to even never! The reason for such wide variance is due to lack of adequate filtration which includes a good bio filter such as a veggie filter or use of de-nitrifying material/products such as SeaChem Matrix or Volcanic Rock. This is why the formula I use to match a UV Sterilizer/Clarifier to an Aquarium or pond can be "off" by 50% or more, since this formula along with all reasonably honest manufacturer recommendations ASSUME a healthy bio filter. In other words, if a UV Sterilizer is rated to clarify a pond of say 1000 gallons, if its bio load exceeds the bio capacity of filtration, it may take a UV Sterilizer rated for 2000 gallons+!! It is also noteworthy that the same UV or even a lessor UV may clear a pond one season and not the next; this is quite common as a pond matures, in particular in a pond with inadequate filtration! Another common mistake is to simply run even an effective true "Category A or B" UV such as the AAP/TMC Pond Advantage, AAP Pro Clear Pond, or Emperor from just a water pump with no pre-filtration prior to entering the UV Sterilizer. This increases water turbidity considerably and thus lowers UVC effectiveness also considerably. Simply placing your water pump in a bed of volcanic rock can often work as a pre-filter, so can a Hydro Pond Sponge Pre-Filter. As well longer periods or never clarifying can simply be due to an inadequate UV and/or one that is properly plumbed. It is also noteworthy than many so called UV Sterilizers are in fact ONLY capable of UV Clarification and therefore should be labeled as UV Clarifiers, but are unfortunately improperly labeled as Sterilizers. This is an important point, even if you are not interested in improving water chemistry via Redox or killing disease pathogens, as a true UV Sterilizer can "Clarify" a pond much quicker than a UV that is ONLY capable of clarification. Also a true UV Sterilizer often works for green pond clarification when a UV clarifier fails due to high bio load, excess sunlight and other factors over load these devices limited capabilities. 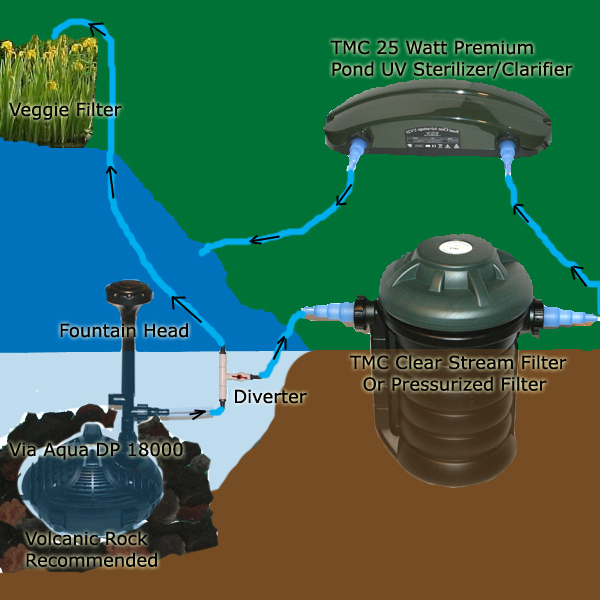 For the UV to properly function in a pond for green water control (UV Clarification), the flow rate should not exceed 40-50 gph per watt of UVC in most Compact UV Sterilizers (such as the Tetra, or Terminator), or 50-70 gph per watt for most higher dwell time straight tube UV Clarifiers (some super high efficiency/dwell time UV Clarifiers such as the AAP Pro Clear UV30/UV55 can go to over 70 gph per watt). Keep in mind these numbers are for UVC Clarification, not level 1 sterilization (which requires slower rates and higher pond or aquarium turnover). 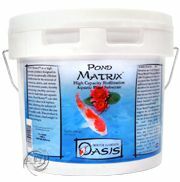 The VERY BEST Pond UV at ANY Price! In larger ponds with high flow rates I often recommend more than one UV sterilizer, with a by-pass from the main line to control flow rate, then each unit connected in parallel for best results, although in-line can work too, just not as effectively. Often a separate, slower pump (with a pre-filter) installed for the sole purpose to run the Pond UV sterilizer is the key to success when the main pump line runs at too high a flow rate for the UV to be optimally effective. For this reason, I also do NOT recommend the popular filters with built in UVs as your Pond's sole UV Sterilizer/Clarifier. The flow rate is usually too high to work properly. As well, the design of most I have seen and used have too high a gap between UV bulb/quartz sleeve sterilizer compartment wall, which is generally not adequate for good UVC exposure. The FACTS are that these filters with built in UV lights are UV Clarifiers AT BEST, and even then poor UV clarifiers. A separate UV is always best! I have maintained ponds with UVs in filters and UVs separate and the difference in water quality in the separate UV ponds is significant! However, do not take this advice to mean no pond filtration is needed, only a water pump and a separate UV run by this water pump is NOT adequate. For CORRECT UV Sterilizer function, the pre-filtration of water prior to entering the UV is a MUST (even if just encasing the pump with volcanic rock as shown near the beginning of this article). What is also noteworthy is that while a basic UV Clarifier can clear green water when properly installed, it WILL often takes days when under the SAME conditions a TRUE level one or higher UV Sterilizer (especially a high dwell time model) can take just a day or two or even as little as just hours while also having the bonus of improving fish disease resistance (via improved Redox Balance).